South-east Asian hawker centres are the stuff of legends. These open-air complexes house a variety of food stalls that sell bang-for-your-buck meals for the masses. Now Melbourne is getting its own version. HWKR is an innovative new Asian food centre located on A’Beckett Street on the north side of the city. But there’s one main difference between traditional hawker centres and HWKR: instead of permanent food vendors, local and international restaurants will be coming in for exclusive three-month residencies in the building’s state-of-the-art commercial kitchens. 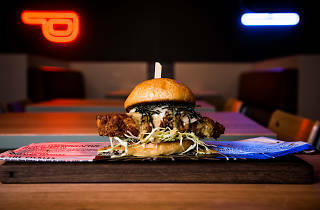 The first cabs of the rank for February, March and April include: Hong Kong’s sandwich kings Bread and Beast; MasterChef’s Reynold Poernomo’s Sydney dessert hub Koi Dessert Bar and his new savoury restaurant Monkey’s Corner; fellow MasterChef alum (and 2017 winner) Diana Chan’s first restaurant, Chanteen; plus Melbourne favourite Rice Paper Scissors’ exclusive pop-up Khao. You can expect ngau lam sandwiches (18-hour slow cooked beef brisket, Chu Hao mayo, spring onion and pickled daikon) from Bread and Beast, French Earl Grey cremeux (strawberry white chocolate, yuzu and yoghurt sorbet) from Koi’s Dessert Bar, lobster brioche (with Singapore chilli crab sauce) from Chanteen and some Filipino roasted lamb ribs (with burnt coconut sauce, pickled cucumber, shallots and coconut rice) from Khao. Drinks come courtesy of the Manymore café, an enterprise set up by the Melbourne-based non-for-profit MAI Foundation. There will be a full Asian-influenced cocktail list, including a No Comparison cocktail (bourbon, umeshu and Campari) and a Panama Split (pandan and banana rum, condensed milk, white chocolate and citrus). There will also be coffee and brekky items from the STREAT team. The space also boasts three dedicated eating areas over two platform levels, so there’s plenty of room to schmooze. HWKR is located at 137 A’Beckett Street, at the bottom of the Eq. Tower. Open hours are: Sun-Tue 11am-11pm; Wed-Sat 11am-1pm. Manymore café is open daily from 7am. ICYMI, Jamie Oliver cooking classes are coming to Prahran Market. 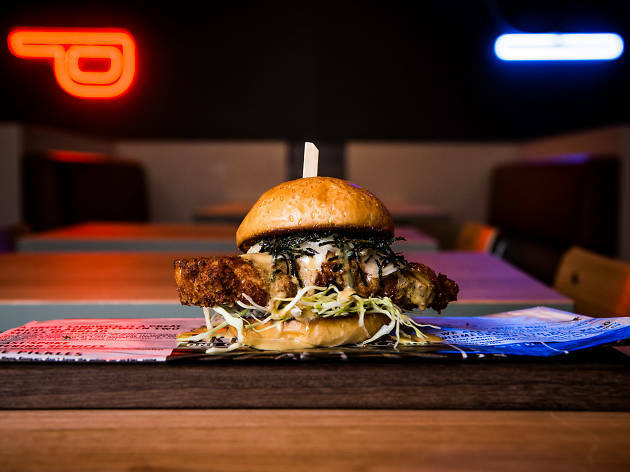 Find more cheap eats with our guide to Melbourne meals under $20.